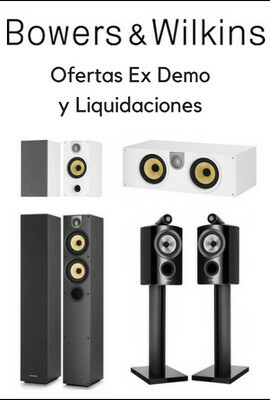 La mejor manera de transferir calidad a un precio abordable. Description: This very attractive dark-red coloured mat finished twin-lead speaker cable is designed to produce the best transfer quality at an affordable price. Each lead consists of 483 x 0.15 mm. high purity Matched Crystal (MC) OFC strands with a dense and very pure silver coating. The resistance per lead is just: 0.21 Ohm/100 meter. The metal cross-section area for each conductor is: 8.54 mmË, equalling AWG 8. The capacitance between the 2 leads is a nice and low 27 pF/meter. Covering the 2 conductors you will find an extra Linear Structured Carbon Å½ saturated layer. This layer dramatically improves the sonic qualities of The MAGNUM HYBRID. 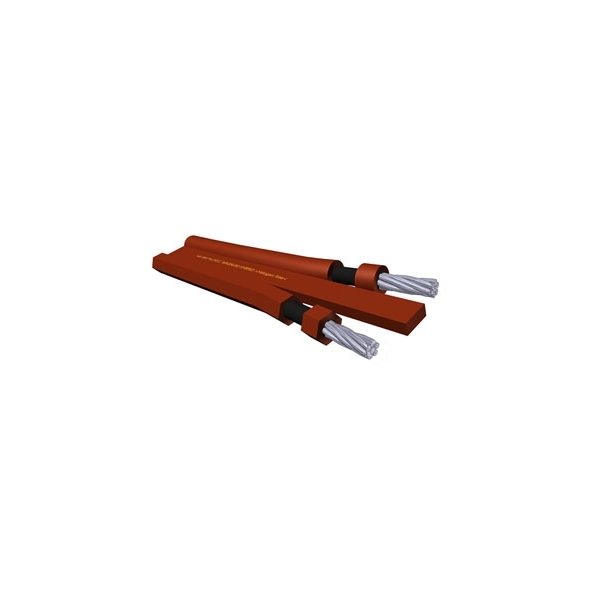 The cable jacket is made of our HULLIFLEX Å½ 5, a very flexible and mechanically superb insulation material. The plus and minus leads are different in jacket shape with gold coloured printing in the flat middle-section. Both properties are easy polarity finders. Type printing at 25 cm. (10") distance makes cutting of specified lengths very easy. Packing conditions: 50 meters per reel in a 310 x 310 x 290 mm. box with a total shipping weight of 14.7 kg. 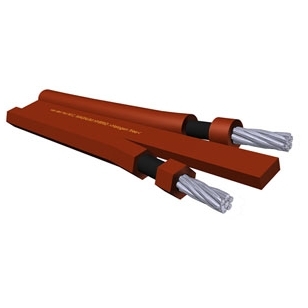 Specifications: The MAGNUM HYBRID Cable Type: Twin conductor Conductor Material: HYBRID: High purity dense Silver coated high purity Matched Crystal OFC + Linear Structured Carbon Å½ saturated layer(s) Design Purpose / Application Area(s): Loudspeaker cable Eff. Conductor Å / Eq. AWG No. / Strands: 2x(8.54 mmË / ~AWG 8 / 483) External Diameter / -Dimensions: 27.0 mm. wide; 7.5 mm. thick Resistance (20 °C / 68 °F): 0.21 Ohm/100 m. Capacitance: 27 pF/m. Characteristic Impedance: - Insulation / Dielectric Strength / Test Voltage: HULLIFLEX Å½ 5 / 300 Vrms min. Connector Types Suitable: Our 6.5 mm. Å cable entrance diameter Bus type Universal Speaker Connectors; Custom mountable on ordered lengths. Standard Sales Units / -Lengths: 50 m. reels; With connectors mounted to specifications: any length; Without connectors: please consult your van den Hul dealer or the van den Hul distributor in your country. Jacket Colour(s) Available: Dark-red Remarks: Self mounting of connectors is not advised since special soldering equipment is required; Our custom connector mounting service is available.